Hyundai finally made Genesis its own standalone luxury brand, and while that will leave a lot of luxury car buyers wondering “What the hell is Genesis?”, it also means the company can do pretty much whatever it wants. One thing I think it should do is build this, the Genesis Essentia Concept, an electric GT car that’s one of the better looking concepts I’ve seen in a while. It’s a good-looking design that came from people who would know: the team headed by Luc Donckerwolke, the guy who used to oversee design at Lamborghini and Bentley and was poached in 2015 to run design for Genesis. And this one was overseen by Sasha Selipanov, who designed the Bugatti Chiron. No wonder it looks good. It’s got a carbon fiber monocoque to go with a very fancy and opulent interior. As I mentioned, it’s electric, a first for the brand (which has only had a few cars out to date anyway, but you get the idea.) The battery pack and electric motor setup would be good to propel the Essentia from zero to 60 mph in three seconds, if it were real, Genesis says. And why can’t it be? It’s a handsome and bold design that’s as good as anything we’ve seen from the European and Japanese automakers in recent years. I hope it gets made in some form. This is a “Genesis Coupe” I can get behind! 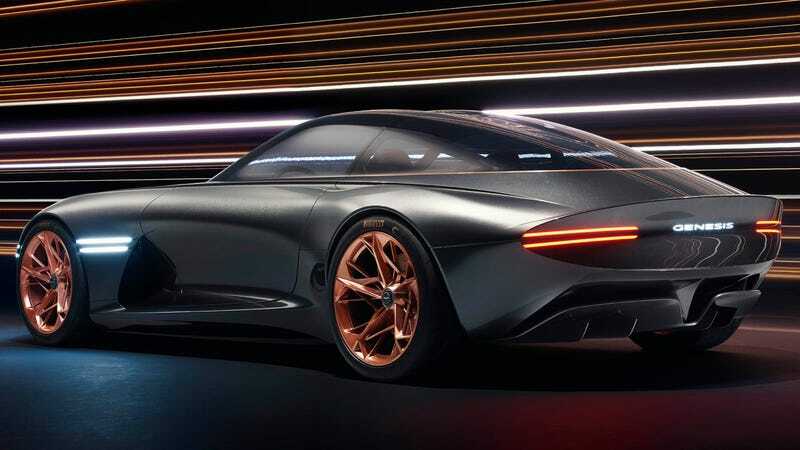 Update: This post has been revised to add that the concept was overseen by the team of Sasha Selipanov, former head of exterior design at Bugatti.